For those lacking the holiday spirit theme of spreading goodwill,you might want to follow the lead of these generous celebs. Funnyman Kevin Hart took time off his many jobs (in my Phaedra Parks voice) to treat 150 lucky LA-based kids with Toyz ‘R Us gift cards worth $100. 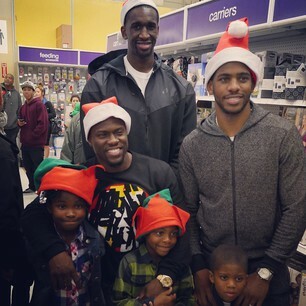 Hart joined Clippers player Chris Paul that urged kiddos to FIRST buy something for others and then treat themselves. The pay-it-forward lesson also applied to Paul and Hart’s kids that joined in on the giving. Watch Hart’s Oprah moment here. Not to be outdone in the generosity department, newbie couple Kylie Jenner and rapper Tyga handed out toys at LA’s Childrens’ Hospital. Meanwhile, down south, “Real Housewife of Atlanta” Kandi Burruss held a “Warm Hearts” coat and blanket drive. Through her Kandi Kares Foundation, team Burress (including Riley and step-daughter Kaela) collected donated blankets and childrens’ coats to distribute at a local shelter. Tagged Celebs Giving Back, Chris Paul, Inmate Holiday Care Packages, Kandi Kares Foundation Warm Hearts coat drive, Kevin Hart, Kylie Jenner, LA Childrens' Hospital gift giveaway, RHOA Kandi Burruss, Toys R' Us gift card giveaway, Tyga, VH1 "Black Ink Crew"